Many homes in the Ocean State decorate using a coastal theme. No matter where you live in Rhode Island, you are not far from the beach, so you can use either window treatment to bring summer into your home year-round. 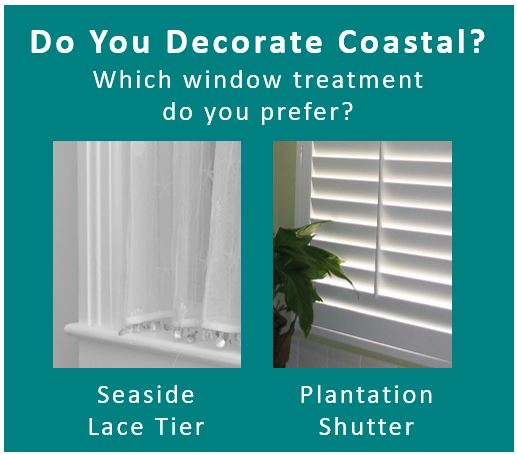 The window treatment on the left is Country Curtains Seaside Lace (similar styles available at www.heritagelace.com). On the right, are Plantation Shutters from a hardware store. Both have a coastal flare. Plantation shutters add style to any room. They are long lasting and low maintenance. However, they typically cost more per window than a regular curtain set up. Nautical lace curtains come in a variety of patterns and can dramatically improve the look of any room. They are easy to install and can be changed with the seasons. However, they are harder to keep clean and may fade. Whatever your preference, both can add the perfect coastal touch that you are looking for and, chosen properly, can radically slash your energy bills.